Model T Ford Forum: Do you have a test hill ? Do you have a test hill ? Model T Ford Forum: Forum 2018: Do you have a test hill ? I live in an urban neighborhood; 1915 single family house and detached garage. After I do various adjustments I drive to Highland Park, one of my favorite test hills about two blocks from my house. The reservoir for my section of town is up there. The entrance has a pretty steep climb on one end and a more gradual grade on the other side. So, I can test from a full stop to a hill climb ... or a running start. It’s also part of my regular “run” when I need to go out for a drive. Every so often when I drive there on a weekend there is a wedding party getting their pictures taken. Being a photographer myself, I always offer the T as a prop if they want it. So, I have a lot of pictures of brides and grooms in the T.
Don't have any hills but we do have bridges. South Florida ain't got no stinkin' hills. When the roads were laid out in the 1870's one hill was so steep that the road now called 296th was built with a switchback in the shape of a horseshoe. Hence the name Horseshoe Hill. In 1934 a cut was made at the top and the road straightened, but it's still pretty steep. I rode up in a friend's 1926 touring that had to low-pedal it, but my 1915 runabout takes it in high. That's 4½ miles away. Just a half mile away is the hill that my uncle Lester used when shopping for a car. He would call the dealer and have them bring a car out from town for the test where Chestnut Avenue dead ends at 91st Road at the bottom of a short but steep hill. If a car could go south on 91st in high, make the turn west onto Chestnut and up the hill without downshifting, it passed the test. The Hudson didn't make it, but I guess the Studebaker did, because my aunts always bought Studebakers until they couldn't get them anymore. "Dead Dog Hill" is what the locals call it. It's in a rural area and probably only a 5 gallon hill, 1/8 mile long, but the kicker is the curve at the bottom the prevents git'em up before you hit the hill. The test- hit the curve/hill at 30 mph in Ford High. A good running car (not a speedster) can make it to the top at 27-28 mph. If the car is still at 30 at the top *great! * but if a car has to shift into a lower Ruckstell or Warford gear *weak* and if Ford LOW is required- well, I won't judge your car. 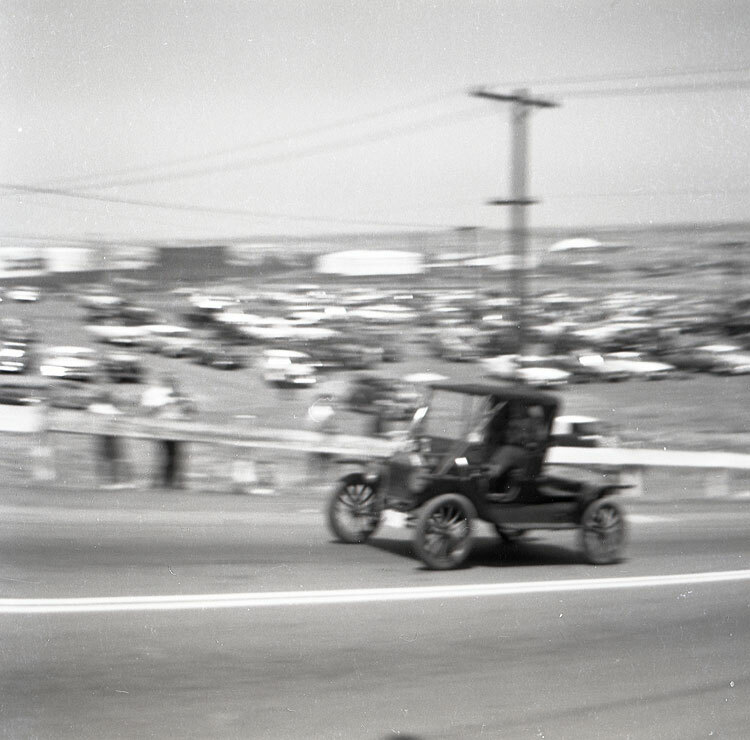 In Hayward CA, there is a hill going up to the state college, that is a great Model T test hill. I am sure Aaron G or Ed Archer can expand on this more. The "test hill" around here was always Hill Street, also known as "Shell Hill." Only 1/10 mile but 22% grade. This is known to Model T'ers as the site of the old Long Beach Hillclimb. Stock T's don't go over in high, but there were many souped-up ones that did. My hill is one on which I can get a running start in high and make it all the way up without shifting down. When I have a passenger with me I need to use Ruckstell. I have another hill which I have only climbed with the 26's. This hill I use Ruckstell and low pedal at the same time. Even with the 26's I usually take the long way around because I don't want to have a bearing problem from oil starvation to the front of the engine. I wouldn't even try it with an under seat gas tank. My rebuild is just around a year old now and I have a solid feeling for what the old gal needs for hills and straightaways. Seems strong and limber enough for what we have in our area. But I do wonder what you guys do with touring cars and three modern (big boned) passengers on the slightest grades. The hill experience that sticks in my mind (kind of) was on the Hillbilly Tour in 2006. I have no recollection what town we were in, but there was a very steep hill in town. That was the year that Anja and I had invited Nancy and Joan, members of the St. Louis club who didn't have a T, to go on the tour with us. We figured that we had a Touring so four of us shouldn't be a problem. That was until we reached the hill in question. We made it about 2/3 of the way up in low and then the car refused to go any farther. Anja, Nancy and Joan got out and walked up the rest of the hill. With just me in the car, I made it to the top and the ladies reboarded. If anyone here was on that tour, you may remember the hill. In Houston, like South Florida, we didn't have any hills (anything a basketball would roll down on its own was a hill). We did have bridges. The Fred Hartmann bridge over the Houston Ship channel was known to slow eighteen wheelers to a crawl and even stall one out, sometimes. In San Antonio and the 'Texas Hill Country', north and west, there are an abundance of test hills. Some can be found here in the city limits. Texas 16, south of Kerrville, north of Medina, has switchbacks that you would swear that you were in Colorado. Garland, that overpass isn't high enough Sunshine skyway would be a good test but I don't think they will let our cars on that one. My driveway is a 17% grade, so that's my test hill. First time out of my garage we used a chain attached to my house foundation to be sure the T wasn't going to wind up in my neighbor's yard. I never roll out of the garage without testing the brake pedal and the parking brake, as well as mentally preparing to turn into the hillside if all else fails. I'm always impressed how easily the Model T goes up all the steep hills in my neighborhood. It may not be fast, but it just chugs right along. All hills are test hills. On the Branson tour 2 years ago I remember a hill some where near there, they had a truck waiting at the top of the hill to pull up the ones that didn't make it. We made it with 4 in the T.
Tim, you beat me to it. I live on that street you mentioned. That hill going up to the university is Carlos Bee. When you go down the hill at the bottom it crosses Mission St.
And becomes Orchard Av. I live on Orchard Ave.
Now here’s a kicker for you, a few years ago I used that hill several times to test one of Ed Archer’s cars! He had/has an Opel GT that had a fuel starvation problem. It would go up that hill beautifully but would starve fuel on the level. Turned out that going up hill fuel would dump into the back of the carb right into the main jet. but a very low float level would starve the main jet on the level. That hill tears up a lot of brakes. My wife used to visit a friend up there that had a daughter the same age as our daughter. Until our daughter got here own car my wife was constantly warping her brake rotors coming down that hill. G.R., The Skyway bridge would be a good test if the top heavy T didn't get blown off the side by the wind. None close to me.I think the Tile Man say's most sections around here fall 11-12' to the north north east.Bud in Wheeler,Mi. Close to me is Newport Hill located in Newport, Indiana. The hill climb draws over 200,000 people to this small town the first weekend of October. Gene, as I remember your test hill is one way, up. How do you check stuff going down? David and Dean, not Branson because Joan and Nancy weren't with us on that one. I do remember the hill in Branson, though, and yes, it was steep. Don't need to test going downhill! I would rather test the brakes going uphill or on level! I want to know they work before going downhill! Highway 410 between Sumner, WA. and Bonny Lake, WA. 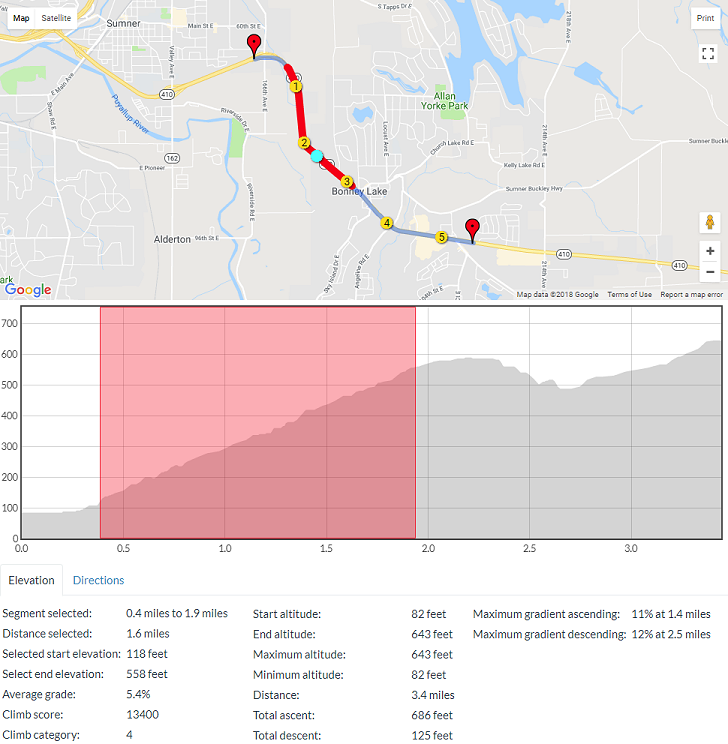 has a long uphill section called "Elhi Hill" that runs southwest for nearly half a mile to a gentle curve to to the east after which it's about a half mile to a traffic light intersection at the edge of Bonny Lake at the top of the hill. All told, it's almost exactly a mile of very steady uphill driving, and I have no idea what the percentage of grade is, but I have driven that hill literally hundreds and hundreds of times, at it has become my "test hill" to determine how my Model A and several Model T's are performing. I know that all of the T's will climb that hill in "high" at somewhere between 20 and 25mph, and the Model A at about 35mph. A mile long hill like that is also a good test of radiators too! None of my cars have an overheating problem, but judging by motometer readings, it is interesting that a couple of the T radiators actually cool a bit better than the others too!